South Sudanese outgoing oil minister has criticized the government of neighbouring Sudan for allegedly backtracking from its initial positive gesture to renegotiate the charges for using its territory to export crude oil from South Sudan to the international markets. There has not been any significant progress in the negotiation, even though the starting was a positive gesture,” said Stephen Dhieu Dau, South Sudanese outgoing oil minister. Dau revealed that Sudan has notified his ministry of its decision to confiscate crude to pay itself of the entitlements which his country owes Sudan in payment for use of its territory. “They have notified us that they will pay themselves in kind if they are not paid their dues. I took this matter to the council of ministers and it was agreed that we should initiate contacts with our regional partners, the African Union and the stakeholders to help us address this issue,” he said. Following the huge fall of oil prices in the international markets and upon a request from his South Sudanese counterpart, the Sudanese President Omer al-Bashir last January directed to review oil transit agreement signed in September 2012. Speaking to the press after a meeting of the national board of oil affairs on Monday, Sudanese petroleum minister Mohamed Zayed Awad said the negotiations with the South Sudan on the review of oil fees are still continuing at the level of committees established in implementation of the directives of President al-Bashir. 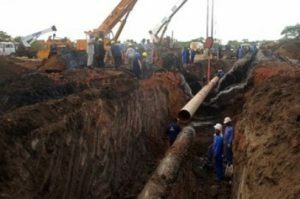 Awad further said the South Sudanese oil continues to flow through the pipeline for the exportation as usual, adding that the formation of the transitional government in Juba would contribute to increase oil production in the landlocked country. According to the Cooperation Agreement, South Sudan pays Khartoum up to $25 per barrel for its crude oil transported through the Sudanese territory. In January 2016, Juba requested the Sudanese Petroleum and Mining Ministry to reconsider its transit fees in the wake of changes in global oil prices. The price of crude oil is currently at $29 dollars per barrel in the international markets. South Sudan is producing oil at 160,000 barrels per day, despite a decline in its oil production due to the violent conflict that engulfed the young nation, killing thousand and displacing nearly two million people. Dau encouraged his successor to “press the button” of negotiation with Sudan. The official said he would be more than willing to continue to help his colleague, the newly appointed minister for petroleum, Dak Duop Bichiok, to push on with negotiation. “We will press the button of negotiation harder but we will continue to ask them and I think they will also understand because it is the interest of the two countries to benefit from the flow of the oil,” he added. The international community should also use their contacts with Sudan to reciprocate the goodwill of the government to negotiate in good faith and make rational charges. A month ago, Sudan reconsidered a series of decisions aimed to normalize bilateral relations announced in January and February. Further, Khartoum said Juba continue to support rebel groups despite its goodwill and efforts to end the inter South Sudanese crisis. Analysts in Khartoum believe that the Sudanese government wants to push Juba to implement a clause in the IGAD brokered peace agreement providing to disarm Sudanese rebels and to prevent their presence in South Sudan. The two countries agreed in September 2012 on a particular fixed changes when the oil prices were higher. However, after the global drop in oil prices, South Sudan could no longer benefit a lot due to the charges which continued to take away most of the revenue.